Told through flashbacks, Prick Up Your Ears offers up the story of the relationship between celebrated playwright Joe Orton (Gary Oldman) and his mentor and subsequent lover Kenneth Halliwell (Alfred Molina). At first blush, the older Halliwell is the educator and Orton his willing student. Those roles were eventually reversed once Orton became far more successful as a writer and was thrust into the spotlight. His sudden fame and career trajectory placed Halliwell in his shadow - and resulted in tragic, bloody consequences. Based on a celebrated biography by John Lahr (played by Wallace Shawn in the film), director Stephen Frears weaves a compelling, caustic, often humorous and never less than entertaining tale of fleeting fame, tumultuous gay romance and overwhelming jealousy. Gary Oldman and Alfred Molina star as gay playwright Joe Orton and his lover Kenneth Halliwell, two men whose lives ended in bloody tragedy, in this mesmerizing gay classic now on DVD and Blu-ray. 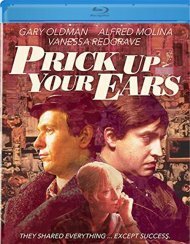 Oldman took home the London Critics Circle Award (Actor of the Year) for his performance in Prick Up Your Ears, alongside scribe Alan Bennett who was awarded the Screenwriter of the Year for adapting the much-heralded biography on which the movie is based. The film features a stellar case - Vanessa Redgrave, Wallace Shawn, Lindsay Duncan and Julie Walters - and offers a great example of director Stephen Frears's LGBT-focused work of the mid-1980s. This movie makes a great double feature with My Beautiful Laundrette. This chilling and graphic portrayal of the life and death of British playwright Joe Orton is a masterful tribute to a man who fearlessly attacked English morals and customs. Gary Oldman is eerily transformed into Orton, a hugely talented, defiantly gay playwright who gained fame almost overnight with his outrageous and viciously funny social comedies. Alfred Molina co-stars as Orton's tormented lover, sometimes collaborator and eventual murderer. Cut down in his prime, Orton's legacy is well remembered here through scathingly witty dialogue and stand-out performances by everyone in the cast - which also includes the likes of Vanessa Redgrave, Wallace Shawn, Julie Walters and Lindsay Duncan in memorable supporting roles. A long-forgotten gay classic, originally released in 1987, Prick Up Your Ears is a brilliantly candid look at the gay scene in London during the late '50s and early '60s - and it features interesting scenes of gay "cottaging". Make sure to pick up this new edition released by Olive Films. 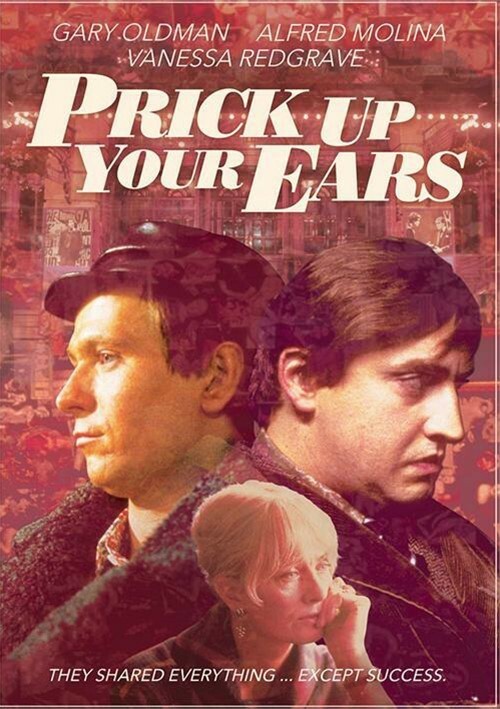 "Prick Up Your Ears" is a gem of a movie. It tells the true story of English playwright Joe Orton and his homosexual relationship with his talented but not so successful partner, Kenneth Halliwell. It is a solid drama and most amazing is that it is twenty years old. Joe Orton was a daring and rebellious writer. Told through flashbacks, Orton's literary agent, played wonderful by the incomparable Vanessa Redgrave, relates her memories and reads entries from Orton's diary, beginning and ending with his horrible murder. 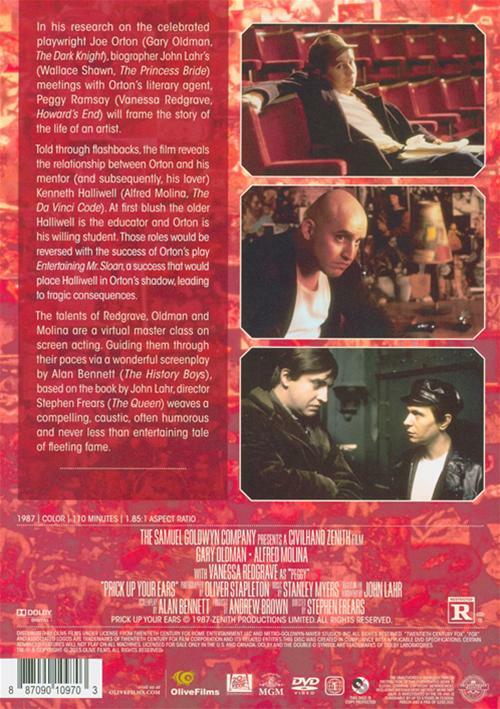 Born into the lower class, Orton (Gary Oldman) teamed up with an ambitious writer, Halliwell (Alfred Molina) at the Royal Academy of Drama in England,. They collaborated for years and when Orton broke out on his own, fame bit him on the neck. His plays include "loot" and "What the Butler Saw" and the charmed the critics and the public with his black comedies. At the same time he was living in a homosexual relationship which, back then, was illegal. He was also extremely sexually adventurous. The competition between he and hi s lover heightened and Halliwell dejected, feeling rejected, and very jealous hammered Orton to death in 1967 and took his own life immediately afterwards. It was not only success de t talent that brought Orton fame. His personal charisma and luck also helped. The two men, who seemed to be talented equally were split apart when one of the pair became an award winning playwright and the other had no luck whatsoever. Orton's death in 1976 caused quite a stir not only by the way he dies but by the fact that the nature of his relationship with Halliwell was revealed to the public. It was Halliwell that seduced Orton when they were students and it was Halliwell who was more imaginative but a bit disturbed. After the two had begun their relationship each spent half a year in prison for defacing library books and while there Orton's agent discovered his talent and guided him to success while Halliwell stayed behind in the shadows of his lover.